Kentucky is reportedly going after Calipari with both guns blazing. Several reports state that the Memphis coach met with his players today and sounded like a coach with a foot or more out the door. SI.com reports that UK has not asked for permission to speak with Calipari as of 1:00 pm. Sportsline suggests that's because Calipari's people are dealing with a third-party representative of UK. Again, this is only relevant to UGA in so much as Memphis might be a better fit for Anderson geographically, and Memphis might be more desperate to hire him. UGA does play in a better conference, but Memphis may be inclinded to spend like a drunken sailor to land Anderson given that the basketball coach is THE financial engine of the entire Tiger athletic department. Calipari's total salary plus annuity at Memphis is in the $2.8-3.0 million per year range. It's extraordinarily unlikely that UGA will pay more than $2.8 million per year for anyone. Speaking of Anderson, Jason Whitlock of the KC Star today writes that Missouri should pay Anderson an elite level salary. Here's hoping they don't. Asked this in the other comment strand, but could it be Parker firm speaking with Calipari for UK? They already handled one UK search for Billy G.
Parker isn't involved in the UK search. That's from their AD. We shouldn't forget about the UVA opening. well that's just great---we're f'ed. Talk about being left at the alter---Bama has their coach in place, UK will have theirs, and Memphis absolutely will target Anderson. I felt good about us landing Anderson until this whole UK-Memphis thing exploded. Now I'm afraid we'll be left with our plan C or D list of coaches. 1. The demands won't be insane, thus being successful there would elevate you to God status quickly. 3. Great recruiting base with D.C. nearby. UVA is also typically ranked as the #1 public university in the country, so academics would be a nice sell to recruits families. 4. Great college town and good seasonal weather---much like Georgia/Athens but slightly colder. Beautiful area as well in the foothills of the blue ridge mountains. However, I've heard the academics are tough for athletes as they don't have all those silly, b.s. majors that most programs offer (like Housing, Family Development, etc.) Thus a lot of athletes flunk out yearly. And, anytime you have Duke and UNC in your conference, you know its going to be an uphill battle. The UK AD's job is on the line, so he is going to be willing to break UK's bank to try and get a high level coach. I'm really surprised it would be Calipari though. Just enough sleaze around him to make it a risky choice. If Calipari leaves Memphis, my question would be whether they aim even higher than Anderson. Calipari raised the bar for that program, and with an NBA team in town it's a bigger market than it used to be. I wouldn't be surprised to see them go after someone with a little more NBA flair. ESPN is reporting that UK has asked for permission to talk with Calipari. Just came across SportsCenter before OTL. I'm not sure why everyone is assuming Memphis would get Anderson over us. The only way I see that happening is if they just throw far more money at him than we do. Because let's be honest, Memphis is a C-USA school, and that was always Calipari's biggest complaint. Why would Anderson want to move from a major conference to a mid-major? Memphis is a good basketball school, but still a lesser conference. Patience guys. There is no need to panic. I trust the AD to have other candidates if Anderson does not work out that is provided he is the top choice. There was not a guarantee that Anderson was coming here before UK came open. Heck I predicted Gillespie was going to get fired three weeks and I had just my intuition about UK. DE has a lot more intimate knowledge of the business than me so I would think he has been war gaming a lot of different scenarios. It is now obvious that we had marginal interest in Grant and Grant knew that Donovan was not going to UK. Also it does not appear that there was a lot of bidding interest in Grant. It would be a positive to name a coach by Thursday though since Final Four weekend is the assistant coach job fair. Uhhh....UK is parking the Brinks Truck outside the Memphis Athletic office. I'm reading $40 M over 6 in one report. FoxSports has it at $5M a year. I think UK must be run by idiots. To do something that extreme in this economic climate is just asking for backlash. I would say that limits on salaries for coaches and AD's is about to hit the legislative radar. If we are going to limit executives' pay for companies that receive taxpayer dollars, the argument will go that we should legislatively limit state employees pay, as well. I farted and it smells like Gainesville, FL. I'm getting worried now, we should have for permission to speak with someone by now, I think that memphis absolutely gets first pick of coaches before us.. And right now anderson is the trendy guy.. But maybe we're not as interested in him as we all think? Maybe we're seacretly interested in villanova's coach jay wright? Or maybe we want capel before we want anderson? And maybe bobby knight is our next coach? Idk what's going on.. But hopefully we learn something soon! Sorry if there are any errors on this, I'm sitting on campus waiting on my next test to start, so all this was typed from my blackberry..
oh, and good luck on your exam! You're wrong one points: it's actually a FedEx truck. "New basketball coach announcement is coming very soon. Possibly as early as the end of this week though, likely not until next week. Press conference coming up and damon has asked for the UGA basketball band to be there. That's all I got for now. Likely the decision has been made and it should sneak out into the press soon. If I hear anything more specific, I'll pass it on. Just to confirm - we have been on the lookout for a new head basketball coach since December of 2008 and we have yet to ask any school for permission to interview any coach? Is this a prerequisite to hiring (as I assume) or a merely gesture made in good faith and fair dealing? Do any of you have something to protect me from the sky that is now falling? You guys pay zero attention to the college basketball landscape. For days now I have been telling you that Mike Anderson is not heading to Athens. The "fit" is not correct given his current success at Mizzou and the recruiting juice he has built up. Memphis, yes that is a better fit for Anderson as of RIGHT NOW. Recruiting is hot, success has been established, the fan base is built, and he will get paid. Of those 4, only 1 is available in Athens: He will get paid. Why would he take a step down and head to Athens? Please think through your posts and rants! The rumor going around is that we got Bobby Knight for 5 years. Waiting until the end of the Tourney (and his Vegas show) to announce. Bennett went to UVA. Memphis abc is quoting rivals and saying that Calipari is gone for 6 years for $40. I know anon @ 4:20 first stated this, but I am wanted to add a website. Perhaps the reason none of us have heard about us asking for permission to speak with a coach is because we hired a search firm to find us a coach? Anyone think about that? It seems a lot of folks are getting bent out of shape because they think we haven't been active. Evans hired the firm for the purpose of keeping things quiet, and it seems to be working. 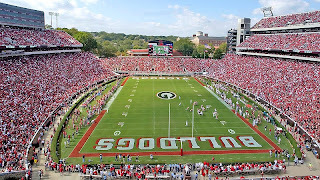 On a sidenote: I've heard from a friend of mine in the UGA band, and he told me the same thing that somebody posted up above: the AD is planning a press conference later this week or next week to announce the new coach and they want the band to be there. So, one would assume that they are close to a deal or have already come to an agreement with somebody. "According to one source, the boosters are trying to convince Calipari to reject a multi-year, multi-million dollar offer to become head coach at the University of Kentucky. Another source said Calipari was instead lobbying for former Tiger assistant and current UTEP coach Tony Barbee to be his replacement in Memphis, possibly using the threat of current players leaving the program as leverage. Among those at the meeting are said to be William B. Dunavant and John Stokes." Bobby Knight - 5 year deal. Heard it here first. Signed, DH. Cooper, big name coaches have left for unproven jobs (like ours) previously. Take Lute Olson leaving final four Iowa for lowly Arizona. Heck, at that time Arizona could barely match what Iowa was offering, but he ended up taking over that hapless program and making it one of the very best in the country. I agree that we have about a 25% chance of getting MA, but if we don't swing for the fences we're guaranteed not to hit a home run. I highly doubt (especially in these financial times) that we spent money towards a search committee to hire someone who threw himself at us (and Bama) over 3 months ago. Let's put the Knight rumors to bed. If we hire Bobby Knight I'm going to vomit. WHO SAYS THERE IS NO INTEREST IN UGA BASKETBALL? Sorry for the caps, but as all of the blogs are demonstrating, The University of Georgia is a sleeping giant in basketball not just because of the talent base and the money Evans is going to spend, but also because we have huge fan base walking through the basketball Sahara looking for a oasis. Anon, and Anon, and the other Anon, we will not hire Bobby Knight. If we do not get Anderson, we will get someone that will build a winner! This is as much fun as the damn tournament! I do not care what that damned columnist in birmingham said, we don't have Grant because we didn't want Grant (we are not hiring any Shermans either). If we wanted gim, we would have him. Scarbinsky is just a second rate columnist sucking up to a bunch of families with tobacco spit on both sides of the truck! I just took a sh*t and it looks like Urban Meyer and smells like Tim Tebow. So the wahoos have a coach and washington state is now looking for a date. Is Capel in the running? Personally, I would rather have Anderson, but Evans may be looking for the bigger name.